2 Bedroom Upper Floor Flat For Sale in Sheffield for £270,000. 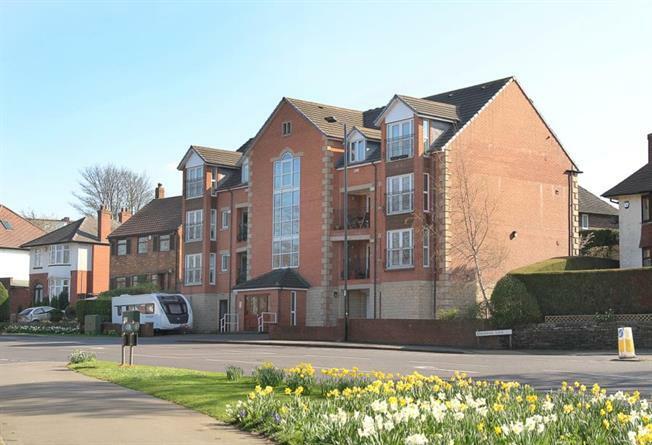 An internal inspection is absolutely imperative to appreciate the size & standard of accommodation offer in this beautifully presented 2/3 bedroomed first floor apartment situated in on the edge of one of Sheffield's most sought after suburbs in an exclusive development of just 6 properties. Decorated throughout to a high standard in a modern & contemporary style with the benefit of double glazing & gas central heating. Undercroft Garaging providing a secure car parking space beneath. Ideally located for the full range of superb amenities, Crosspool is one of Sheffield's most sought after residential suburbs with a host of local amenities including local shops, restaurants, and excellent schools including Tapton secondary, Lydgate Junior and Lydgate Infants. With excellent public transport links and access to the city, principle hospitals and universities. Within easy reach of the open countryside of the Peak Park and Rivelin Valley, Approximately two miles from Sheffield City Centre. A communal entrance door with a secure entry intercom system opens into a Communal Entrance Hallway where a staircase rises to the first floor landing. The entrance door to the apartment opens in into an Entrance Lobby with a further doorway into the 'L Shaped Hallway. The Spacious Lounge is carpeted throughout. A pair of double glazed French doors open onto a Juliette balcony, offering far reaching views to the front. Further double glazed window to the front. The lounge is equipped with television and telephone points. A further double glazed door opens to the Enclosed Balcony providing an excellent outdoor seating or entertaining area with views to the front. Dining Room/Bedroom 3has double glazed French doors also opening onto the enclosed balcony. The Kitchen is fitted with a superb range of base and wall units on 3 walls in a modern Shaker style with beech finished doors. Double glazed window to the rear. Granite effect rolled top work surfacing having an inset stainless steel one and a half bowl sink and drainer with block mixer tap. Tiled splash backs. Fitted shelving with under lighting. Recessed spot lights to the ceiling. Fully integrated brushed stainless steel electric oven, four ring gas hob, brushed stainless steel double extractor hood with light. Fully integrated fridge and freezer and automatic washing machine. Wood effect flooring throughout. Master Bedroom has a pair of double glazed windows to the rear and a radiator with TRV. Carpeted throughout. Fitted bedroom furniture providing excellent storage. A doorway opens to the En Suite Shower Room with w.c., wash hand basin and shower. Fitted with recessed spot lights to the ceiling. Shaver point. Double Bedroom 2 has a double glazed window to the rear having a radiator with TRV beneath. Carpeted. Fitted furniture to one wall with central vanity unit and wardrobes to either side providing excellent storage. The Bathroom is fitted with a three piece suite in white comprising low flush w.c., pedestal wash hand basin and corner bath, wall mounted electric shower. Fully tiled. To the Exterior, the property has the benefit of garaging beneath the property providing a secure car parking space and further visitor parking. To the exterior of the property are well maintained communal grounds with well stocked border and lawned areas providing an excellent outdoor seating or entertaining area.